Oh, Huffle, how do you stand it! well, we can't tell you what might be wrong with him but please don't set him to "dry"
I agree with Random Felines, dont use the fluff dry cycle! Arghhhh! 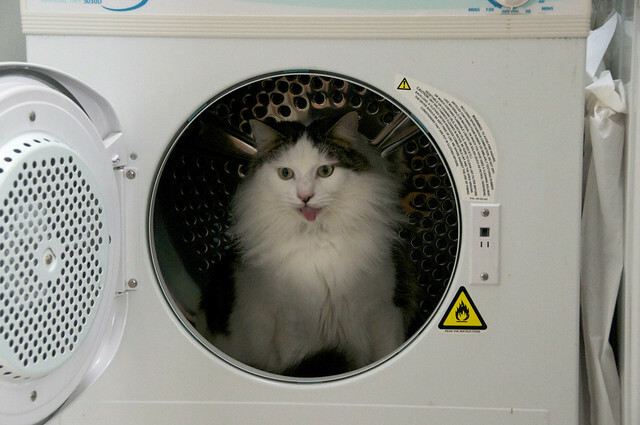 It's the mad cat who lives in the dryer! Does he always stick his tongue out at you? Maybe he is an electrical engineer, how about that, Huffle? Oh noooooooooooos he is in the static electricity creating monster. Talk about bad hair day. See, that's why he's so fluffy - spin cycle! Hey, the dryer is a neat place to hang out in! I have been known to hang out there also. however, he shouldn't be placed in a dryer if wet. other than the obvious heat-related death, his floof will stand on end and he will float away. MOL< Teddy is living dangerously! Ha roo roo roo!!!! Mom just squirted water out her nose!!!! OUTSTANDING!!!! Sorry Huffle, I can't help you there! He's eating lint, isn't he. What in the Hello Kitteh is he doin in there? Get outta there, before you take a "tumble"! Teddy, you are a nut! Teddy, you are a mystery, that's for sure! Teddy's crazy! But as fun kind of crazy. Eh , I have NO idea what´s wrong with sitting in the dryer ??!! Haha! Excellent. You need to trim that photo so it's just the circle of the opening. Teddy looks he's got rockets! Put your tongue away, Teddy! The mystery of the dryer kitty named Teddy. Huffle, you have your paws full. I don't think I would be caught dead in the washing machine! HA!! Oh my gosh, that is an excellent picture. The tongue! The floof! Mistook the suds for nip smoothie, eh Huffle? I think Teddy thinks he is the reincarnation of Louis XIV of France, the Sun King. Perhaps Teddy is creating his own Palace of Versailles in the dryer? I am not sure what's worse: your goon or my maniac! Hmm, Yous has a Goon, Daisy has a Maniac and me has the worst!!! Kozimoto!!! Hey that looks like rollin... uh rollicking fun. Hanging out in the dryer is one way to ensure that every garment in the entire house gets the proper allotment of cat hair on it. We think Teddy is a genius! Hmm, we think he's spun one too many cycles. That is a classic picture, it really is. I really think you need to hook up with one of those kitty girls from "Sweet Purrfections", Teddy! You all seem to put the same spin on things. Mebbe that spin cycle was just more than he could handle....MOL! We don't know why we didn't comment the last time we saw this back in August, but it was just as funny the second time around! !